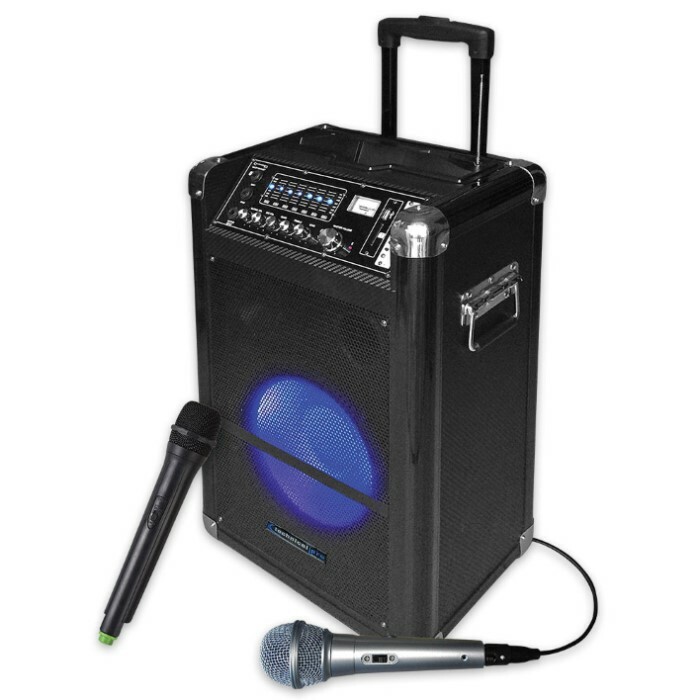 10 Inch Portable Wireless Rechargeable PA System | BUDK.com - Knives & Swords At The Lowest Prices! This speaker pushes out an astounding 1050 Watts at peak power so you don’t have to worry about being heard when you use it. Functionality is evident in every aspect of this unit, starting with the built-in rechargeable battery that fully charges in about 8 hours. 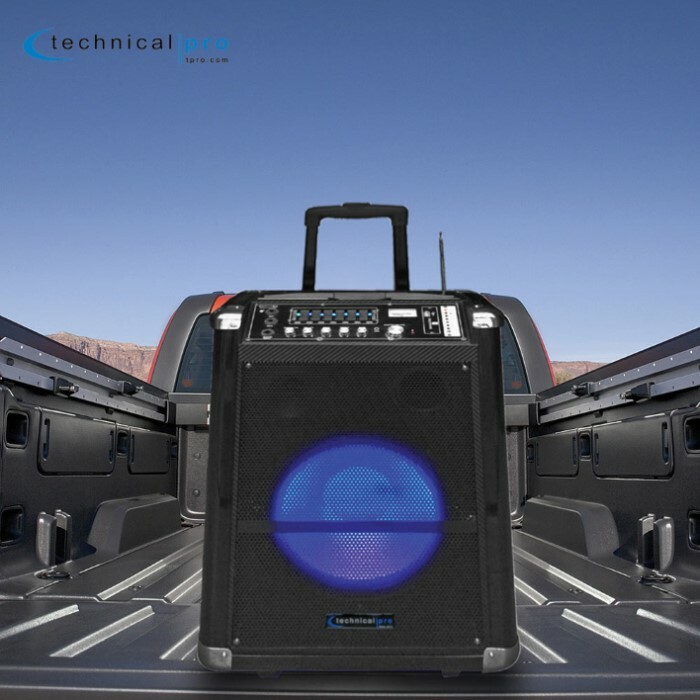 Once the unit is fully charged, the 30 Pin iPod dock, USB port, SD card reader and RCA inputs give you connections to just about any audio source you can think of! You’ll love the included wireless VHF handheld microphone, which allows you to walk and talk without tripping over microphone cables within a 50 foot range. 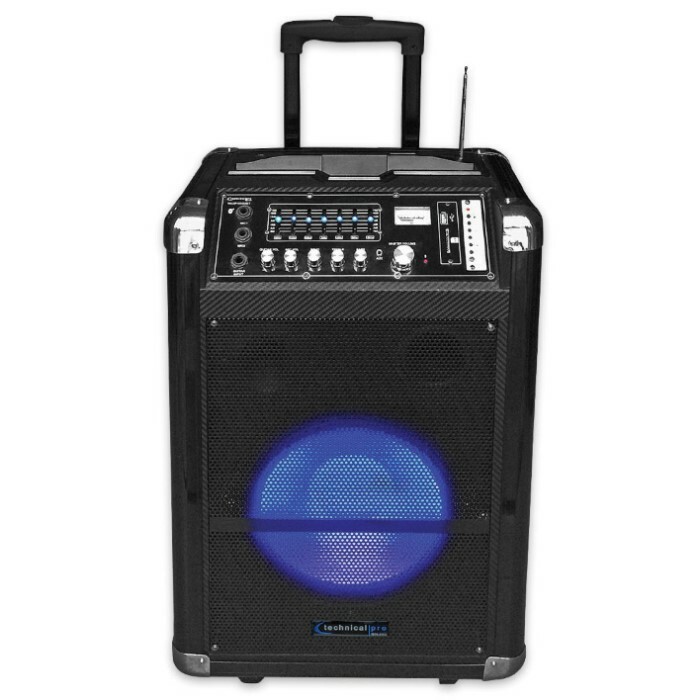 In addition to the wireless microphone, there’s the added bonus of the Bluetooth v2.0 with EDR adapter, which gives you instant wireless connection to Bluetooth enabled devices. It was also built for easy travel with a set of wheels and a telescoping carry on handle. The full length perforated grill and reinforced steel corners ensure that the unit is protected at all times.